Thanks to my Nook and my local library adding Overdrive ebook borrowing, I’ve got access to many books. Last night, I checked out Megan Smolenyak’s “Hey, America, Your Roots Are Showing“. The first chapter is all about the repatriated remains of soldiers. Megan works with the miliary project that handles these remains. Genealogists research the soldiers on MIA lists using the scant information in military records. They try to find living relatives who can give information and DNA samples. The more DNA collected the more likely the remains can be identified. Her work is intensive, time consuming, and challenging. This fascinated me because I’ve done some genealogy research for the Korean War MIA project. Though, I confess that since my Dad died 3 years ago and my life was turned upside down, I haven’t had a chance to do much. My research was nowhere as involved as Megan’s! I researched online and sometimes was able to track a soldier on the list to his living relatives. The reason I got involved was because of my Dad’s oldest brother. Charlie served in WWII. He was on the Liscombe Bay in the Pacific when it was torpedoed. His remains were never found. My Dad told me that months afterward, the Navy sent them a letter claiming to have Charlie’s remains. If you read the details of that day and knew that Charlie was in the boiler room which took a direct hit, then you know there was no hope of finding his body–not with the horrifying scene that ensued. My Dad advised his Mother to refuse them. What he believed was they had “someones” remains but they weren’t Charlie’s. He didn’t want to bury someone else’s brother. To him, it was like cheating the rightful family. That has always stuck with me. While it might have made his family feel better to bury someone, for my Dad it wasn’t right. There are so many families like my Dad’s who didn’t get that final closure. By doing this research, I have a chance to maybe help a couple of them out. 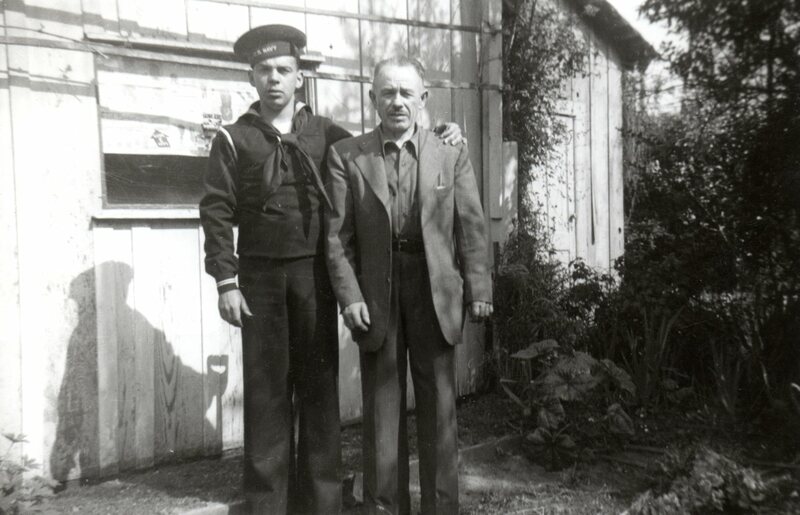 Uncle Charlie with his father just months before he died at sea. One of the soldiers I researched ending up bringing me right back to my home town which blew me away. It was a Japanese family. The soldier was from Southern California. So, my research began there. I was able to follow the family through the 1930s and to their internment in a camp in the Midwest during WWII. Then, I followed some members back to California as they tried to restart their lives. I was able to find a couple of obituaries on this family. I was sure surprised when I found that one of his brother’s lived on the street behind ours in the 1970s. It wasn’t until I figured out the proper pronunciation of the surname that I realized he was the same man that my parents talked fondly of from their days in Little League! Knowing that, I was able to track another brother who had died within months of doing my research. I found his children and was able to pass on names, addresses, and phone numbers to the project. I hope that they will be able to find someone to give DNA from that group. Never in my wildest dreams did I think a strangers name on the list would lead back to someone my family knew so well! You just never know where research will take you. If you do genealogy research and have some free time, why not research a name? Pick one from your state and see if you might be able to help. You could be giving a long lost soldier back his name and helping a family find closure.